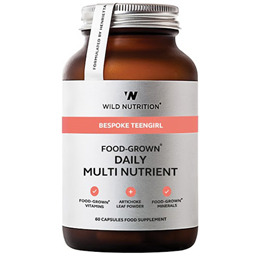 Wild Nutrition`s Food-Grown Teen Girl Daily Multi Nutrient is a unique complex of Food-Grown vitamins, minerals and botanicals formulated for teenage girls. This expertly designed formula provides the essential nutrients to support the maintenance of normal psychological and cognitive function, hormonal activity and the reduction of tiredness and fatigue. The Food-Grown Teen Girl Daily Multi Nutrient benefits from organic ashwagandha and organic artichoke for natural reinforcement during a time of rapid development. Vitamin C and Bioflavonoids incorporated in Citrus pulp; Beta-Carotene incorporated in Carrot concentrate; Mineral enhanced Yeast providing Thiamin, Riboflavin, Vitamin B6, Vitamin B12, Vitamin E, Biotin, Choline, Inositol, Vitamin D3, Niacin, Pantothenic Acid, GTF Chromium, Manganese, Selenium, Zinc, Molybdenum, Iodine and Phosphorous; Lactobacillus bulgaricus providing Copper and Iron; Folic Acid and Vitamin K incorporated in Alfalfa concentrate; Vitamin E combined in vegetable oil; Lithothamnion Calcareum providing calcium; Purified sea water providing Magnesium; Organic Artichoke leaf powder and Organic Ashwaghanda powder, Vegetable Cellulose (capsule shell). Take 2 capsules per day, with or without food. Below are reviews of Wild Nutrition Teen Girl Daily Multi Nutrient - 60 Caps by bodykind customers. If you have tried this product we'd love to hear what you think so please leave a review.